It has been awhile since I have entered into the conversation on the Second Amendment, or as those who wish to distract from our Constitutional rights like to call to call it… gun control. No matter what you hear from the talking heads, the American public is not ready to relinquish their rights or privilege to defend themselves with firearms. In fact The Daily Beast posted an article citing a New York Times/CBS poll in which it was found that the number of Americans supporting stricter gun control in general has slipped 7 points in just two months. It doesn’t take a genius to figure that the terrorist attacks in Paris and San Bernardino have people scared. They clearly see that those who wish to kill us are armed and trained to take as many innocent lives as possible. Waiting helplessly and defenseless for first responders to show up leads to certain loss of life. The question becomes, What are your odds? Will you be one of the lucky ones who survives? There is no way to answer that, because without the means to defend yourself, your chances are going to be random. The only way to raise those odds is to be as prepared and trained as the enemy. And it is becoming clearer to more Americans that limiting firearms from potential victims will not save more lives. But what you may not know, is that the number of women who identify as “first time gun owners” has steadily risen over the last few years. I was one, myself, just a few short years ago, and my personal experience is that many of my female friends (and friends of friends) are overcoming their reticence and yes … fear of firearms … to take responsibility for their own protection and that of their families. 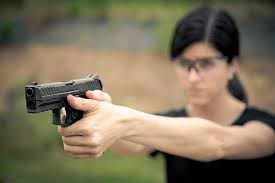 Once they are introduced to professional training, they realize that we are not all “gun nuts”; that we take our training seriously, and our goal is to be both proficient and safe with a firearm; and it is for one primary reason – to defend ourselves when we fear for our lives. They are often surprised to hear us say that we hope we never have to use our firearm. But if we feel that our life is in danger, we want to be able to stop the threat before it is carried out. And they are equally surprised to find out that we spend as much time training how to be safe with our firearm as we do being accurate with it. Training in both these areas keeps unnecessary injuries and deaths at a minimum. In other words, responsible gun owners are not a threat to the general populace; do not present an increased danger to society; and just might be able to prevent the tragic loss of lives we have recently witnessed. If just one person at the office Christmas party had been carrying for self-defense, and been adequately trained for an active shooter scenario, the terrorists might have been stopped from killing 14 people. If just one of those lives had been saved, wouldn’t it have been worth it? And I’m sure you have noticed my repetitive use of the word “trained” in this post. I, personally, would like to see legislation requiring mandatory training before the issuance of Concealed Carry permits. In my mind, that would not only influence the attitude of those who are skittish about the general population carrying firearms, but would go a long way towards forming the proper mindset of a responsible gun-owner. The bottom line for me is this… it is apparent that the terrorist threat to this nation, and the world, is only going to increase. As trite as it sounds … the Bible tells me so. And that’s good enough for me. God wants me to trust in Him, and I do for my salvation and my eternal life. But I know there is a god of this world who is intent on killing and destroying as much of mankind as he can; and especially Christians. So I will use the brain He gave me, and the rights upon which this country was founded, to defend myself and do it as an informed, trained, and reliable firearms owner. I will take my stand against Evil because I know that self-preservation and the need to persevere are both a gift, and a duty, from my God. None of us can deny that evil exists; and while God wishes us to love our fellow man and hold fast to that which is good, He has also made us responsible for those in our care. That means husbands and fathers are to protect their wives and families; mothers, their children; and all of us, the innocent and defenseless. Unfortunately, the ungodly and the wicked are running rampant under the influence of the enemy of God. While I pray for protection, I also know that I must be prepared to defend myself. Sadly, that’s just the reality of the world in which we live.